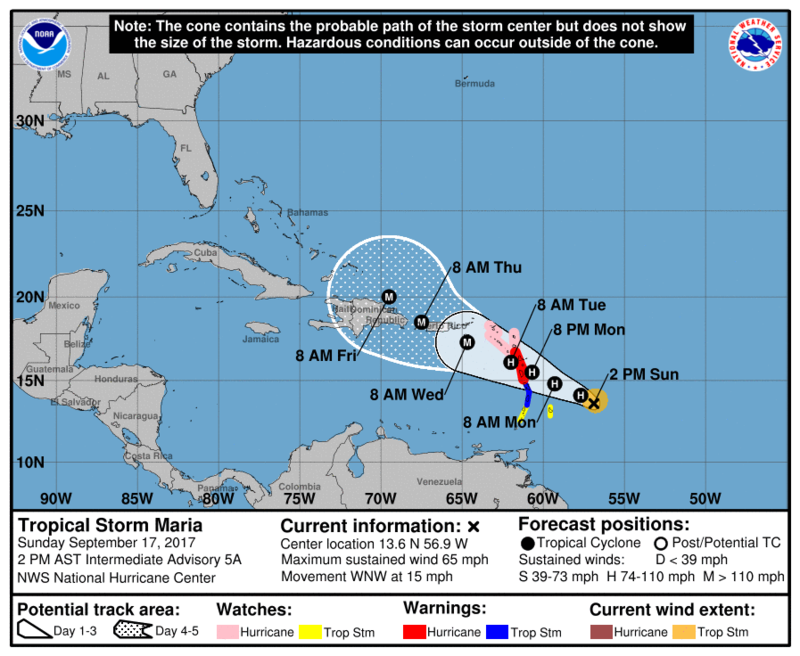 We had plenty of warning that Hurricane Irma was coming, but the uncertainty of when, where, and how bad continued to be the wildcard right up until the last minute. Whereas at the beginning of the week it looked like Irma was going to skirt up the east coast of Florida now it seemed that it was going to come up through the Keys on the west (Gulf) side of the state, aimed directly at the Tampa Bay area. 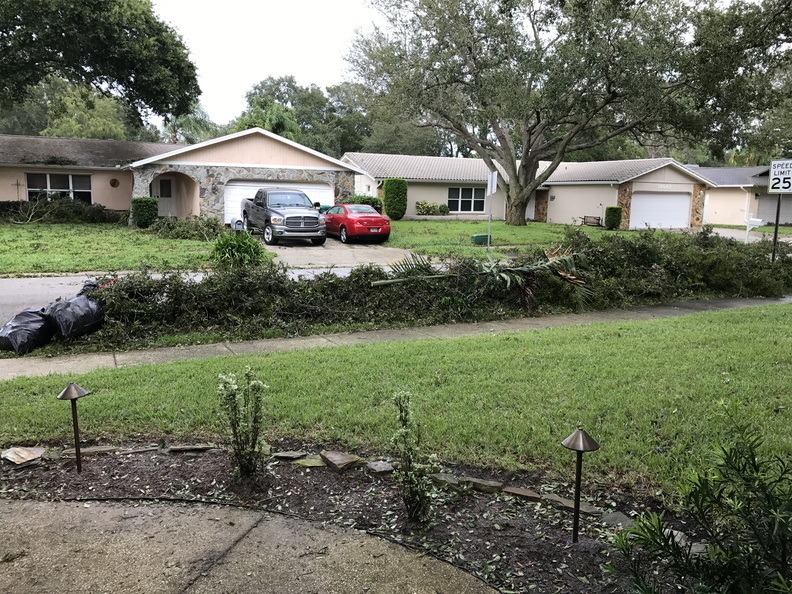 We finished preparing the inside and outside of the house on Saturday so we spent Sunday glued to the TV watching the local weather broadcasts and playing the waiting game before Irma’s arrival, hoping we had made the right decision to stay home and not evacuate the area. As the storm made landfall in the Keys as a Category 4 storm, and then again at Marco Island as a Category 3 Sunday afternoon, we continued to watch the news (and gape at the images we were shown, like the water draining out of the bay). Irma weakened as it moved north towards us, which was good news so it looked like she was going to hit us as a low Category 2 hurricane (not good, but better than the previous forecasts). We lost our Spectrum cable TV, internet, and phone service Sunday evening, which meant no more Facebook updates for family and friends (maybe the triple play service isn’t such a great idea). Luckily the AT&T cell towers were still working (and we still had power) so we were able to call and text message to keep in contact. We started to hear thumps on the room as branches came down, and we also found two small leaks around the frames of our hurricane windows! Luckily we caught these early and were able to block them with towels before too much water got inside. The winds and rain really picked up late Sunday evening and we did finally lose power shortly after midnight Monday morning. We moved into our “safe room” (the master bedroom closet) and tried to get some sleep as Irma raged outside. Monday morning, with the storm finally north of us, we poked our heads outside to survey the damage to the neighborhood. We had a lot of downed branches, and one part of our fence and gate were blown down, but there no major damage. The same went for the rest of my neighborhood. We took a walk around, joining everyone else who was “rubbernecking” at the debris left behind. We saw some large trees down, but nothing that had fallen on a house or car. The rest of the day we spent cleaning up: piling all the debris on the right-of-way (for eventual pickup next week), taking down the plywood, putting back all the outdoor furniture, putting away the lanterns, radios, and other emergency supplies, basically trying to get the house back to normal. I measured just 4″ of total rainfall in the pool, which seemed pretty low for a storm like this. 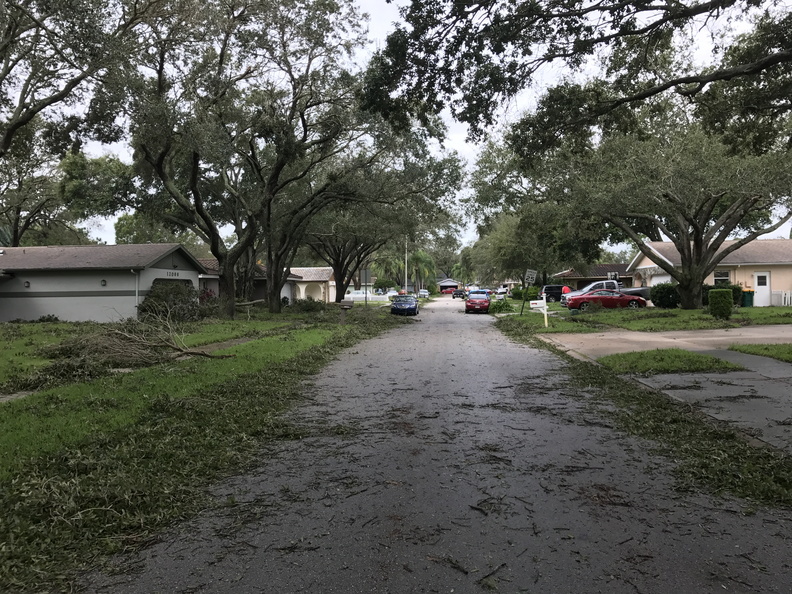 The power was still out, so in the late afternoon we took a drive around to survey the damage to our surrounding area and to see if anything was open. But with the power (and traffic lights) out, we didn’t find anything (actually, there was one Chinese take-out place with a line out the door). Back at the house, for dinner we used the grill to heat up some soup, made some toast, cracked open a bottle of wine, and ate out on the lanai (the weather was very pleasant). Duke Energy got our power back on at 9:15pm Monday night (a 19-hour outage, not too bad). The rest of the week was definitely strange … the aftermath of people coming to terms with what we had experienced. The streets behind our house were still dark so people started using generators. The air was filled with the noise of those running engines for four more days until their power was finally restored on Thursday night (we were very lucky to have it back as quickly as we did)! My office re-opened on Tuesday so I went back to work, but my wife and daughter had school cancelled until next Monday (7 days of school cancelled in total). People continued to clean up and the piles of debris around us got bigger and bigger. Folks who had evacuated north started coming back, most getting stuck in more traffic like they experienced trying to flee a few days earlier. Spectrum continued to falter getting the cable service restored, and the AT&T towers in my area were also damaged so we had no internet access at home. If we disabled LTE and dropped to 4G it worked a little better, but not much so we would go driving to get better service. Spectrum finally got the cable in our area working Friday evening, just in time for the weekend (a 5-day outage). The gas stations that were lucky enough to get fuel deliveries still had lines of cars waiting to fill up (I still have my 10 gallons of reserve in the garage so we should be good for now). 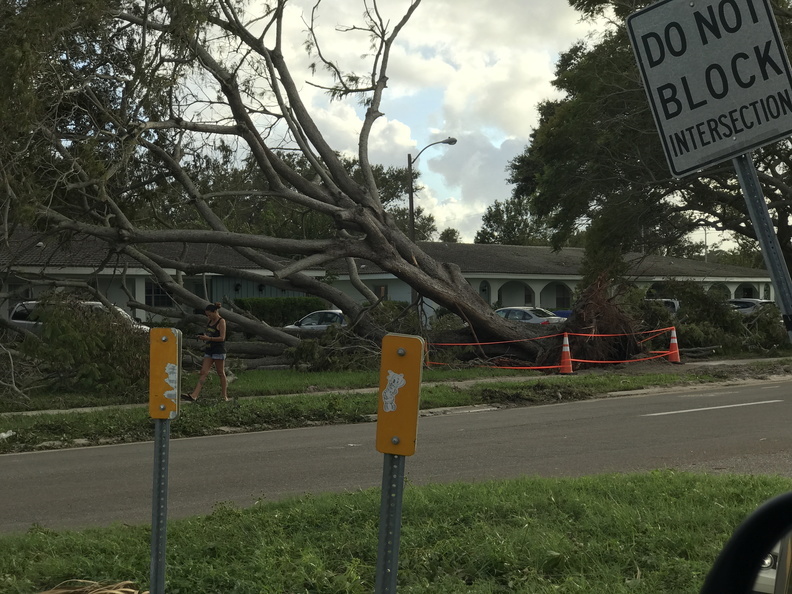 So what did we learn from this latest hurricane experience? having a working FM radio is important. After the power went out, I got the cheap FM shower radio out of our hurricane supplies and put in fresh batteries. It worked for about 2 minutes and then died completely. All of our other FM radios were in the alarm clocks, and the radio portion doesn’t work on the battery backup (that’s just to keep the time). I’ve ordered a new radio (with crank and solar options) for the kit. we should store more ice. We started saving ice early in the week by emptying our refrigerator’s ice bucket into plastic bags. We also had a 10lb bag of ice in the outdoor freezer left over from a spring party. Still, once the power went out we put a lot of the food we wanted easy access to into the cooler so we wouldn’t have to open the refrigerator or freezer too much. If our power had been out more than 19 hours, having more ice would have been a big plus. having a UPS can provide extra power when the lights go out. I’m not sure why I didn’t think of this until it was too late. When the power went out, my UPSes in the house kept the cable modem, phone MTA, server, NAS, TiVos, etc. running for a while. I should have taken one of the UPSes into our safety room and used it as power for one of the alarm clock radios, to run a small fan, charge our phones, etc. The cable went out hours before the power did, so why was I bothering with keeping the TiVos running? Total brain fart on my account there. I should have a pair of rubber boots in the hurricane supplies to wear in case of flooding or wet activities (ordered). get gas as early as possible, and go during the day while people are at work. We filled our tanks (and the gas cans) on Tuesday night, almost 5 days before Irma’s arrival. We went after I got home from work and there were already lines. And since I had to keep going to work during the week, I had to top off again (I got lucky with a little gas station near my office). I also added a funnel and siphon hose to my hurricane kit supplies, just in case. I need a better battery-powered drill. With the power still out on Monday I was trying to remove the plywood with my old (2007) 18V cordless drill. First of all, it just didn’t have the power to loosen some of the concrete anchors and second, it died way too fast. My spare battery turned out to be bad, so once the other battery was dead, I had no way to charge it and had to resort to elbow grease to remove the rest of the screws. I’m thinking about something like this one and maybe even a hammer drill for the concrete anchors. 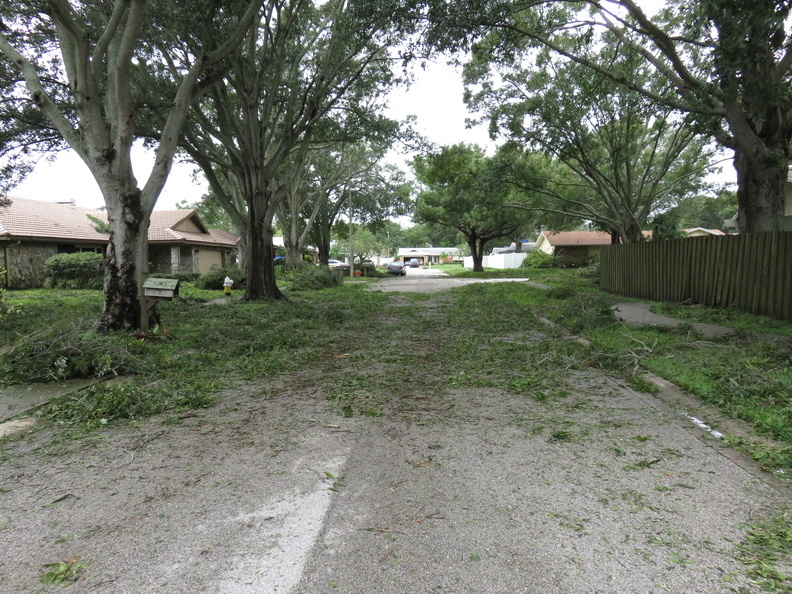 get all of the trees trimmed before hurricane season begins. We got lucky with this one as we had a large tree removed from the side of our house earlier this year and as part of that, we had the tree guys trim and clean up the rest of trees in the yard. Still with all of that we had a lot of fallen branches. I can only imagine how worse it could have been if that old tree had still been there and all of the other branches hadn’t already been removed. Facebook can actually be useful! I’m not a big Facebook user, but my sister-in-law set up a private group with all the family members so we could post and share updates. Of course, this didn’t help once our power and internet went out, but we were able to send SMS updates to one person and then they could post in the Facebook group to relay the information to everyone. This is also the first time I got to mark myself “safe” after the storm with Facebook’s Safety Check. and finally, our next home project will be to get all of our entry doors replaced with hurricane impact-rated doors so we don’t have to worry about hanging plywood anymore. I don’t know why we let this slide after replacing the windows in 2008, we just never got around to it. Well, Irma was a reminder that we need to get around to it now.